Bob Burns was born in Scotland, but emigrated to New Zealand, where he ran a motorcycle business in Christchurch. In 1954 he was achieving very good results with his tuned Rapide, onto which he put streamlining pattered on what he knew of that used by NSU. With this set up he began attacking sidecar records, and achieved 145.9 MPH. At this point he approached the Vincent factory, which volunteered a pair of used "big port" heads to aid his afforts. He also met Russell Wright, who had bought the 1953 Show Lightning, and was breaking national solo records. 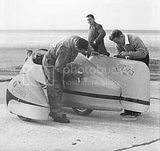 The two men joined forces to attack both sidecar (Bob) and solo (Russell) records using the Lightning, tuned and streamlined by Bob. It is a matter of history that in 1955, on the very narrow Tram Road outside Christchurch, the pair achieved world records of 162 MPH (Bob Burns, sidecar) and 185 MPH (Russell Wright, solo). The woorld's fastest motorcyclists! This image was taken during a BBC television recording session on Pendine beach in 1955, a few months after Bob Burns (wearing overalls on the left) set on July 2, 1955 a new F.I.M. World Sidecar record of 163.04 mph (298 km/h) on the Tram Road at Swannanoa, near Christchurch, New Zealand. Bob Burns would do a few very fierce runs in front of the camera, after which a journalist also could have a try. I heard from member Joe Brown who is at the Utah Salt Flats, he tells me that the target the Germans have set for Wright to aim at has been put at 210 m.p.h. At 1 a.m. this morning I also received a telegram from Bob Burns saying he was on his way here, and that he had done the sidecar record at 176.4 m.p.h. though Wright had missed with a top speed of 198.3 m.p.h. True to their word they arrived here today. Russ went out on the town, while Bob, Ken Tyrer, my girl friend and self went down to our local Chinatown for a good dinner, made merry in one of the "Penny Arcades", picked up a quart of Canadian Rye, mixer and lemons and returned to the girl friend's house to do some serious talking. We mixed drinks and talked till way past my bedtime and it was a grand evening. I'm very sorry that Bob had to leave next day. Bob was saying that he owes a big thank you to Capt. George Eyston, of the British Car Team (in Utah), and also to member Joe Brown whose trailer they used. The sidecar record was ready to be attempted on German timing equipment, but at the last minute the American timekeeper, Art Pillsbury, stopped the run for reasons of his own; so that was one day wasted. He also told them that they would have to modify their rig to comply with the safety regulations, the extra fittings added another 100 lbs. in weight! Their next date was set for the 18th of August, as they couldn't get hold of any timing equipment before then, the Germans having packed up and gone home. Early on the 18th, Burns and Wright were on the Flats but as the timing equipment hadn't been set up they had to wait till one o'clock. On the first run they had, the front cylinder cut out at 5,000 r.p.m. (145 m.p.h.). That evening they repaired the damage, a collapsed front cylinder, and didn't finish until 3 a.m.
old record of 173.98. They were on solo gearing because at first they were only going to be given the afternoon to make both records and wouldn't have time to change. Seeing that the temperature was approximately 95 degrees they decided to quit for the day. That night they lowered the gearing and were ready for bed at 2 a.m.
August 20th, the last day for timing, they got out of bed at 4 a.m. ready for the twelve mile ride to the Flats. When they arrived there was a wind blowing which didn't stop until 10 a.m. The first sidecar run on 15%, nitro mixture was 174 m.p.h. They raised the nitro content of the fuel to 20% and took the record. Bob said that on one run with the sidecar the wind took him right over the runway markers which are 100ft. apart. Now it was Russell's turn, or so they thought, but it turned out that the timing machine missed marking the kilo record. By the time things were straightened out and Bob pushed on his way again, only 30 seconds remained of his time limit. That's why the kilo record is 174.6 m.p.h. and the mile 176.4. By now they were ready for Wright, so approaching from three miles to the south he did 198.3 m.p.h. From two miles on his return it was 192 m.p.h. Unfortunately time was up, he couldn't make it as time waits for no man. A member named Harry Bellville now owns their outfit, I wonder what plans he has for it? Not long ago, I sent an airmail letter to congratulate Bob Burns on behalf of us all for his splendid effort in taking the World Record. (Are we making him an Hon. Member at the A.G.M.? I HOPE SO!) The other day, I received his reply so here it is, verbatim. "Delighted to receive your letter of 10th inst., and it really does the old body good to know the effort really is appreciated by Club members at home. I cannot help wondering how many blokes would love to have the opportunity for a. similar 'do' at home. I mean - you can jack things up for yourself here, but at home you'd never dream of it. Think of it; tuning the `brute', load it up on the trailer, drive out of town 30 odd miles in the early morning, and there is a lovely four-mile stretch of road to do trial runs on. No bench testing - get the results on the road, and if the work is done correctly in the 'workshop it makes the testing easy. What a Iad I believe he told the Vincent' agent here he would screw on the throttle until the blood came out of his ears! "Now then, Sam, about your query on the standard stuff - that's easy - in all the tests and record attempts, plus a bit of beach racing, I can honestly say the Rapide has never given a minute's worry except for clutch slip from standing starts ONLY, if one is kept on the line with the bike in gear, whilst the flag is up. You do not do this if you can avoid it, of course. I strip my, motors regularly. and piston rings are the only things that I renew, as they are the life of the party. "I found that after a lot of high speed work, clutch slip would set in on the Lightning due to the non-setting jointing cement creeping out and being thrown onto the linings. I cured that entirely by cleaning the damned stuff right out. (Possibly get away with this whilst the bearings are in new condition.) Now, I would mention that I am a person who does not believe in caning an engine; I would rather be a bit up on gear ratio, and running just a whisker rich, and don't go over 6,000 revs on the Rapide or 6,500 on the Lightning (I'm quoting you a tuned Rap, although still on the standard big-end assembly, the original shock-absorber springs, clutch linings, etc. - although only 9,200 miles were on the clock when I bought the machine; brakes good enough except when the shell is fitted - Boy, what a smell of hot Ferodo comes up from the front). "On record attempts, brakes are not used hard, as you have tons of road to ease up in. Accelerating similar-you don't have to scream away in bottom gear, but just take your time and build up steadily (bottom gear 5.25:1), but hurry things along after changing into second at around 90 per. "In bottom cog on trial runs, the Shell in use, when winding on hard, the effect of the machine wanting to turn left (she wouldn't crab) was terrific. You see, the bars are only 15in. wide across. the 'drops' and you just have to haul everything right. I think the high gear, when the clutch is being fed in, is why she doesn't crab left, but in contrast, the Rapide, on her trials with the lower bottom gear took off like a rocket, crabbed like hell, even when changing into 3rd, when it was still drifting the front wheel sideways!" "…... 154 per, equalling the existing record. Everyone excited except yours truly, just thinking, and remembering how, on the runs, I had lost revs by merely raising the head a couple of inches to look over the cockpit rim to squint up the road, because the machine would drift down the camber, and you had to look down on the road rather than along it to correct this. Made my mind up - MUST keep my head down in the timed section on the last run. Away we go -1-2-3, and a nice 6,500 in third, into top, kilo mark just in sight, pull in-boy!, 6,000, or 177 per on paper, look up again just before the markers for a , final aim through lose 400 revs doing this, or 12 m.p.h. (every 100 revs equals 3 m.p.h. on 2.62 gear), duck down again, motor falters right in the kilo, snap throttle shut, open-building up again, 5,800, and that's how we finished the run, and for the first time during these runs, I looked at the roadside while closing down, and boy, it made me think, because I had drifted right down the right-hand camber and was close to the shingle road verge.
" . . . If you want any further gen, Sam, write-shall be only too happy to oblige.